A design inspired by a true Cynic. 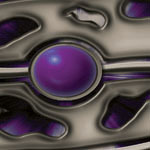 This futuristic digitally constructed design is sleek and razor sharp. Let your mind wander into the great unknown with this metalic masterpiece. Available in several colors.